Headset wireless designed for fitness instructors. Te BLX14 configuration includes the BLX4 single-channel receiver, BLX1 bodypack transmitter, and the SM31FH headset microphone. This kit also includes power supply, headset windscreens, and user guide. Shure BLX Wireless Systems combine professional-quality sound with simple setup and an intuitive interface for legendary audio performance right out of the box. It is an ideal combination for exercise instructors. It is usable for many other applications, but the attributes of the SM31FH make it ideal for exercise environments. 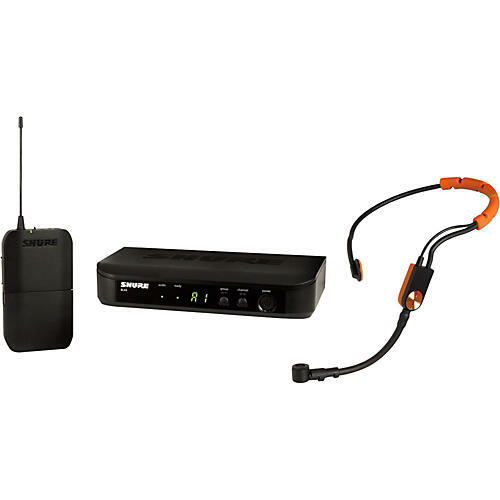 The BLX series bodypack transmitter works with lavalier and headset microphones. With the WA302 1/4" to TA4F cable, it also works for electric guitar or bass. The beltpack features an On/Off hard toggle switch, preferring to eliminate the multi-function push button that is used on some wireless transmitters. Many users found the multi-function single button to be inconvenient and unreliable.It additionally features continuously adjustable gain, a single bi-color LED for battery status, and a rugged ABS polymer body. It operates on two AA batteries for up to 14 hours of battery life. Its sleek, side taper design makes it a comfortable fit on your belt.